Booking.com - Another Case for Advertising Standards Authority? As Groupon get dragged over the coals for some of their copywriting and promotional methods we wondered whether the advertising bodies (including Google) had any thoughts on the advert below. Now call me a pedant - and I have been called worse - but can the following advert be truly complete and correct? I recall adverts being rejected for the use of superlatives and that if you can't back up the use of a word you can't use it. "Google AdWords doesn't allow ads that make inaccurate claims. Inaccurate claims include competitive claims, superlatives, and unverified offers." "Google doesn't allow ad text that contains competitive claims against other companies such as "better than," "faster than," etc., unless there's specific support for this claim clearly displayed on the ad's landing page. Support for the claim can be in a variety of ways, such as a chart or table that compares the features or prices of your product versus your competitor's product, or a competitive analysis discussing why your product is superior. They cannot legitimately claim the lowest price guaranteed for Edinburgh Hotels (insert Dubin/Madrid/Paris etc) - are they seriously suggesting that there is no lower price available anywhere. Nonsense and could easily be proven as a false statement. Specific hotels? Or featured Hotels? Or lowest price gauranteed for a single hotel? Maybe they can support the claim when we get to the page. Google do after all say that any claims need to be supported specifically. There is no specific support for the claim on the landing page. Try it for yourself. Why would Google overlook the breaking of clear advertising rules of one of their bigger advertisers? A Discount on a Deal - How Far is This Going to Go? When is sanity going to kick in amongst the industry? Ok we have made our comments known about deep discounted deals on flash sale sites but when is the industry going to get a grip? Here's how ridiculous it's got we've got one on the discounters offering a discount voucher for a discount! Yup another ten pounds off your already loss making room. Wow. We've removed the name of the hotel and the actual deep discounter but here's the email. Does this not simply take your breath away? Where is reality? Since you joined us, we noticed that none of our deals have quite tempted you to buy, so we would like to offer you a £10 voucher towards a fantastic 3-night break for two at the Hotel XXXXX nestled on the shores of XXXXXXXXXXX! This amazing mini-break was already heavily discounted at £99, but with your exclusive £10 off voucher, it's an even more astounding £89 for 3 nights! 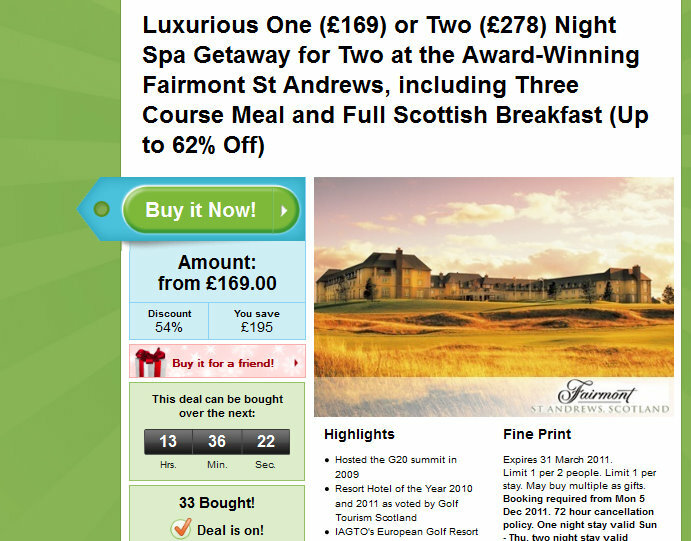 This great offer includes a bottle of bubbly and breakfast each day. This is the perfect opportunity for that relaxing break you and your partner need, and a great opportunity to enjoy the breathtaking scenery of the XXXXXXXXXX. To claim your £10 credit, simply visit (website removed) and enter the code "WAIT A WEEK AND IT'LL BE FREE" (made up voucher code!) on the purchase confirmation page. Remember this deal is only on until Sunday night! So please get onto (your deep discounted partner) and get your voucher! If you're looking for information on your Booking Engine for 2012 we've created an easy to browse bookshelf for you featuring the products and services of offer from Bookassist. As we've said in previous mobile website blog articles accessing hotel and travel information via smart phones and mobile devices is not the future it's the present and accommodation providers across Scotland need to be looking at what their offering is ahead of what is going to be a highly competitive year ahead. If you haven't given it a thought spend five minutes reading the article and then deciding how you should act. What we've created is both uniquely simple and affordable - under £500 affordable - and with the growth in mobile devices is something that you really should consider now. Well it's pretty seamless really. The mobile user searches for a hotel in St Andrews and finds The Inn at Lathones in either Google Adwords, natural listings. He may also be using Google Hotel Finder or Google Places. It's important to your search strategy but not to your mobile website because as soon as he click onto the hotel website address it recognises that it's a mobile device and diverts the user straight to the mobile version homepage - on the left. The user can now simply scroll up and down the menu and click on what is required. The hotelier can update their pages easily and quickly using our content management system The Claymore Project. Add local events, special offers or even daily menus to encourage the conversion of the enquiry. It's up to you as it's all managed by you - drag and drop new pages in as you wish. Mobile sites are stripped down so your website is really travelling light. No needless graphics or long content. The user profile is likely to be on the move and looking for a room or a restaurant or an event in the near future. Introduce your property and sell it. Who, What, Why, Where, When and How always works! Outline your facilities with a simple to scroll list of highlights and selling points. Describe your bedroom facilities, wining and dining options to give the guest the comfort that you have what they are seeking. If you wish emphasise and promote something that's taking place or an offer to encourage immediate booking. Remember this site is probably competing with the OTA's (booking.com, Hotels.com and possibly even Groupon and Living Social) so you need to sell up what you have on offer in the same way to get the much needed DIRECT sale. The Mobile version website may be stripped down but that doesn't mean it lacks neither functionality nor personality. You can add and managed your images shown on the site easily from your own computer and change when required. This includes the background image on the mobile website menu/home page. The interface for the mobile user is easy too. Click on the Gallery, select an image and a full version of the picture comes up on screen. The user can then simply swipe the screen or click on the arrows to navigate through the whole image gallery. Easy to use and with the proper images another way to convert the "Looker to a Booker". So you're not sacrificing the use of images in your mobile site just keeping them in a single place. It therefore allows the user to send an email or phone the accommodation provider with a simple click or tap. It can also link directly to a Facebook page if required or go straight to the booking page. If the mobile device user wishes to call the hotel directly to enquire about reservations it's made simple for them. A tap or click on the phone number will bring up the Call box. The same process would be used for an email or if requested a text message if the hotel wished to provide a dedicated mobile number. For a mobile device it is essential that location information is provided in a user friendly manner. Our mobile website uses Google Maps and means that the user (if their location services are activated on their device) can easily get travel directions to the premises from their current location. 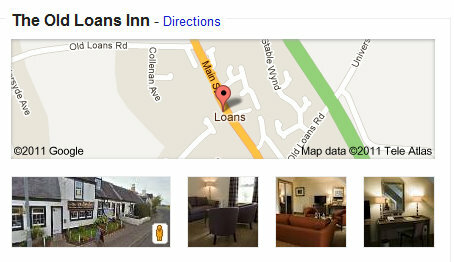 They simply click on the address or location button and the map with the hotel location appears. Turn on Route and the directions appear. This is what your potential visitor wants to see. Not only does it include the practical it also includes the graphic. The little yellow man icon at the top of the map page indicates the availability of Street View. 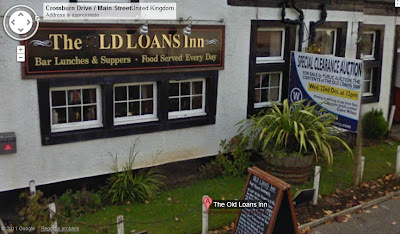 A tap or a click will bring up the Google Street View image of the property. Nice little touch. There's little point in creating a fully functional easy to navigate mobile version of your website if it can't just as easily take bookings. Our mobile websites are powered by Bookassist Booking Engine which means that for current Bookassist users you have to do nothing more than update your extranet as you currently do. The same availability and rate details feed your mobile site as feeds your main site and Facebook page. Not a problem then you can still use our mobile sites - simply treat it as another distribution channel - we can set you up on Bookassist within 72 hours and you can have your own fully functioning, low cost of commission, seamless mobile room sales channel (complete with complimentary Facebook App!). We have designed the Mobile Website to be useful for any and every accommodation provider. Once the mobile user has clicked the calendar dates they are taken to the choices screen on the left. The screen will show all the hotel's room options and packages. With the new drag and drop interface in the booking engine it easier that ever to position your room order to suit your sales needs. Room prices and full descriptions with a specific image for each package will show on the screen and the Book button sits prominently at the foot of the description. The booking button takes the mobile user into the third and final screen in the booking process with confirmed credit cards being entered to confirm the reservation. Note: like the version on hotel websites, the mobile version is fully PCI compliant - something worth remembering and a major plus point for your customers and merchant services provider. The user clicks the Complete My Reservation and the transaction is complete. In all honesty it could probably take less time to complete the reservation than it does to read the above! It is very simple, safe and secure. Ensuring return on investment from your web app Bookassist booking engine also tracks all bookings through its systems, including hotel web app bookings. The powerful reporting is based on booking engine integration with the Google Analytics and will show you at a glance how your mobile platform is performing. Providing proper mobile and social media access for hotel guests can create a strong impression of the business and what it stands for and for sure properly built platforms drive conversion. You can get your hotel or accommodation on the move with Open Rooms Mobile in less than 72 hours and for current users of Bookassist there's a great incentive to get your website mobilised before New Year. Open Rooms MM12 is our suite of four website design and development options for accommodation providers of all shapes and sizes across Scotland. Call us on 01292 52104 or download a Open Rooms Mobile PDF for more information. The increase in “Flash Sales” sites has changed the dynamically priced room promotion dramatically over the past six to nine months. It’s not that price lead promotions are anything new; it’s just that the delivery mechanism – most commonly email marketing - has become quicker and more efficient. The result however has been that the customer is now seeking a deal and many hotels feel it necessary to compete on price at the current time. As part of an overall marketing strategy this need not be a bad thing but basic principles must remain – the best route for any hotel to generate business is direct with the customer and therefore developing your own “flash sales” is in many ways better than developing it with a third party. If you’re going third party anyway you should most certainly consider making sure you create your own onine promotion alongside the one you are running with the third party. If you give the customer the opportunity to book a similar limited availability deal directly through your own website they may well switch – booking direct can be more trusted – and save you substantial marketing costs. One thing is for certain if it’s twice the cost of the promotion price there is no chance of switch selling. A simple price lead offer can be easily managed and costs reduced by using your booking engine’s tools. Repeat the above steps throughout the year as necessary! The customers are your customers and you can then nurture them for repeat visits and other services. You can sell valuable secondary spend add ons through the system to every booking – wine, dinner, golf, transfers, flowers and the rest. If done systematically the following process could be completed and ready for distribution in under an hour. Create the sales proposition - £20.12 per person B&B available January through March for bookings made in January 2012. Create a promotional banner on your website and social media with a direct link to the packages if you are selling it fully publicly. Create a “Price Group” or Promo Code if you wish the offer to be limited to those you contact and then Publish the link or promotional copy to your Facebook, Twitter and email marketing campaigns with the direct link to the package on your booking engine page. Track click throughs on your Facebook, email and website statistics. Your Bookassist reports and Google Analytics Goals will give a direct measure of promotional success – compare on and off line conversion rates. For more support on using Bookassist’s Booking engine to help drive more traffic direct through your own website and sales channels call us for a chat or any specific assistance. It really couldn’t be much more simple to use. Bookassist is managed in Scotland by the team at Plan B based in Ayrshire. We provide support and advice on all aspects of the Bookassist system and provide account management support on an on-going basis and provide pro-active communication and online marketing advice where required or contracted. Bookassist CEO Dr Des O'Mahony shares some data on hotel booking performance on mobile platforms, showing the clear and growing opportunities in the area and some surprises in the user patterns. Bookassist launched its mobile web app solution for hotels in late 2009 (bookassist.org/mobile) and more than 150 hotels and hotel groups are now using the solution. We thought we'd share some of the results we are seeing with usage on mobile, both mobile access of regular hotel websites and mobile web app usage. Trends in our data to date strongly indicate that city hotels perform far stronger on mobile than those outside cities, in terms of traffic and in terms of conversion of that traffic to bookings. Also, the lead-in time for bookings on mobile has proved to be very short, with more than 65% of all mobile bookings we track being for within 24 hours of arrival. The necessity of having last-minute availability on mobile is clear for city hotels given this trend. While city hotels are performing much better on mobile, it is clear from our data that other hotels are also showing mobile business growth, though with a time lag compared to the city properties. We expect to see growth continue in all sectors on mobile, which represents a very real opportunity for hotels in the coming months and years, especially with industry figures showing over 100 million smart devices now being sold per quarter through 2011. Figure 1 shows an example of a small European city hotel group and the evolving mobile business it has seen through 2010 and on to today (the figures have been rounded for clarity but are otherwise accurate). 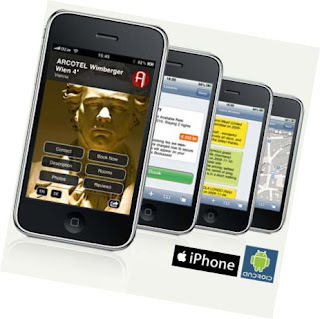 During 2010, the hotel group did not operate a mobile-optimised web solution up to end July 2010, but adopted our mobile solution from the start of August 2010 onwards. The growth in traffic during the first half of 2010 (blue graph) is attributable to the general mobile traffic growth trend in society based on the explosive sale of smart devices in the last number of years. The standard website that this hotel group used was bookable on mobile, but was not especially optimized for it, and recorded a relatively poor conversion of 1.1% to 1.24% across the six month period. We introduced the webapp solution and saw an immediate change in conversion from mobile devices from 1.24% to 2.31% in the weeks prior to and after the launch, a clear vindication of optimized mobile strategy. The hotel group also indicated the availability of a mobile optimized solution on its online and offline marketing, helping increase the general mobile visitor growth trend from that time onwards (blue graph). Mobile advertising was also initiated, though its impact compared to the general mobile traffic growth trend is hard to quantify. Critically, the conversion continued to grow to finish the year at an impressive 2.91% conversion across all mobile platforms. More importantly, the combination of capitalizing on traffic growth and an optimized webapp to drive conversion has had a very significant revenue impact. 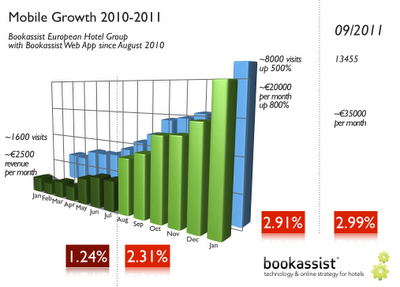 Bookings revenue from pre to post webapp time periods has risen from about €2,500 per month for the group to over €20,000 booking revenue per month in 2010 (green graph). This now represents a significant percentage of the group's online revenue and by the third quarter of 2011 had reached €35,000 in monthly revenue, with a conversion creeping up to 2.99%, a very welcome conversion rate for any hotel on any platform. Overall for clients with this profile, we are seeing up to 5% of online revenue now attributable to mobile devices in 2011, from basically zero at the start of 2010. Market figures for device sales currently show that about 50% of smart devices sold are Android-based. Despite this, only 15% of our figures show traffic from Android devices (see Figure 2). This trend is reflected in general web access data that tends to show Apple's iOS devices taking up to 80% of all online mobile traffic. It appears that since the Apple iOS devices are more of a premium product, their users are more committed users and more internet-savvy, while many Android phones are being supplied by telecom operators as their standard phones, even to users who have no interest in internet access. While our webapp is optimized for both iOS and Android, it is vital that iOS is optimized for in the first case since it represents the largest market right now. When we look at conversion figures, below, an extremely interesting picture emerges. 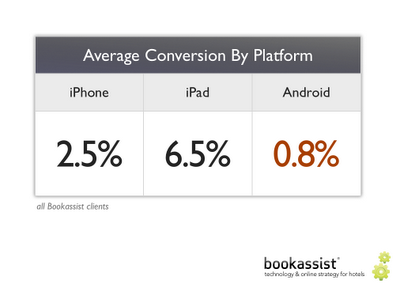 Android users are converting way below the average, at less than 0.8%. iPhone users convert more than three times better at 2.5%, while iPad users convert at a whopping 8 times their Android cousins, at 6.5%. The iPad conversion in particular is strongly surprising and again reflects the attitude of the iPad use to internet usage and engagement. It is clearly vital that hotels consider targeting this platform preferentially and ensure their websites are optimized for it. Mobile is a very real opportunity. Volume is growing, conversion can often be higher than regular web access and is definitely higher when optimized mobile solutions are deployed. iPad stands out as a clear opportunity and with the rate of sales of iPads and their dominance among travelers, it is clearly a target platform above all others. 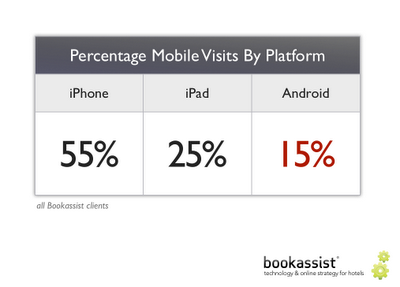 Short term booking is dominating and last minute availability on mobile is critical for successful conversion. Dr Des O'Mahony is CEO and Founder of Bookassist, the technology and online strategy partner for hotels with offices in Dublin, Madrid, Paris, Rome, Vienna and Prague. The Scottish golf industry’s top honours have been announced at a glittering awards ceremony held in St Andrews. 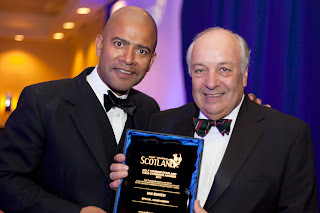 The annual Golf Tourism Scotland’s Gold Standard Awards is the sector’s blue-ribbon event where the very best of Scottish golf tourism is celebrated. Hosted by Fairmont St Andrews, this year’s gala evening saw the presentation of 11 awards including the Special Achievement Award which was received by the former secretary of Prestwick Golf Club Ian Bunch. This year’s Young Industry Person of the Year was presented jointly to Simon Redmond from Macdonald Rusacks Hotel in St Andrews and Valerie Houston formerly of the Royal Golf Hotel in Dornoch. The prestigious Golf Course of the Year award went to Kingsbarns Golf Links which beat off competition from the likes of Castle Stuart and North Berwick. 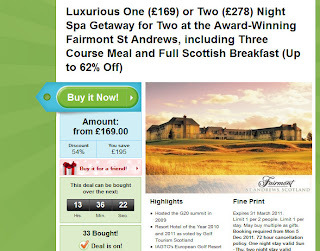 In the accommodation provider category, this year’s hosts Fairmont St Andrews were named the country’s top resort, while Macdonald Rusacks Hotel was awarded the Large Hotel accolade. Crail Golfing Society received the Golf Secretariat award and St Andrews Executive Travel was named Transport Operator of the Year. Elsewhere, Old Loans Inn at Troon received the Small Hotel/Guesthouse award while Meldrum House in Aberdeenshire was named Scotland’s best country hotel. Other winners of the GTS Gold Standard Awards included Martin Roy of Carnoustie Golf Links who clinched the Caddiemaster of the Year accolade and Golf Scotland which picked up the Golf Tour Operator of the Year award. How much business will be lost in rural areas that do not have 3G or even ANY mobile signal? The question above was raised a few weeks back by Alan Rankin the Chief Executive at Cairngorms Business Partnership. He went on to discuss the issues facing hospitality businesses in Scotland when it comes to digital access - broadband, WiFi and plain old mobile. The point was reinforced by those in the discussion group that mobile access was increasingly important yet as a country our coverage was appalling compared to some of our competitors and that with the growth in use of mobile devices for information, travel directions and live reservations we needed to improve the situtaito quite dramtatically. On my own various trips across Scotland it is quite possible to lose mobile signal equally easily in parts of Edinburgh as it is in the western Highlands. We thought theerefore that a quick and easy to complete survey of what's going on across Scotland's tourism businesses wouldn't go amiss. We have produced a quick and easy to complete survey which hopefully will give a snapshot of the picture across Scotland in the first week of November 2011 and will repeat it quartelry if it produces good enough results. There is a link within the survey to a Broadband speed test (uSwitch) which will allow a like for like comparison of speed across the country. Mobile is the fastest growing method of accessing hotel information online. This is not the future – it is very much the present. Online activity reports in October 2011, indicated that 25% of leisure travellers use mobile devices to book rooms, and Google reported that 19 % of all hotel searches happen on mobile devices. It is becoming more and more important that hotels have a relevant workable mobile presence and whilst all of the Open Rooms websites are optimised to perform on mobile devices having a slimmed down version of a hotel website specifically for mobile users makes increasing sense. Ayrshire based Hospitality Marketing business have just released pre launch details of their all new Content Managed Mobile Website for hotels - complete with integrated low cost commission online booking capability. The Open Rooms Pro MM12 package includes aground breaking Content Managed Mobile Website with the full power of the Bookassist Booking Engine inbuilt. It includes mapping, online booking, image galleries and whatever additional pages and dynamic content hotels wish to put on it. Ian McCaig, MD at Plan B and Managing Partner of Bookassist in Scotland explains, "The content is driven from our tourism database which already powers more than a hundred websites across Scotland. The fact that it is content managed gives the hotelier to target on a daily basis the traveller in the location with relevant offers, news and add ons. The booking is then seamless using Bookassist's mobile technology." "Designed for ease of use and booking rooms the Mobile Website is an integral part of our wholly upgraded suite of website options for 2012 - the mobile complements the Open Rooms Lite, Plus and Pro packages aimed at all sizes of accommodation providers. We know that providing proper mobile and social media access for hotel guests can create a strong impression of the property and what it stands for." Open Rooms mobile technology automatically redirects visitors browsing on iPhone, Android and other touch devices to the mobile version of the hotel’s website. The Open Rooms Mobile site has been designed to be both fast and lightweight so that guests who are roaming will not be subjected to large file downloads and potentially larger billing costs ensuring that the customer gets the best experience possible on every platform - on desktop with Open Rooms Pro and on the go with the Mobile Website. Ensuring return on investment from your webapp Bookassist booking engine also tracks all bookings through its systems, including hotel webapp bookings. The powerful reporting is based on booking engine integration with the Google Analytics and will show you at a glance how your mobile platform is performing. Properly built platforms drive conversion. Get your hotel on the move with Open Rooms Mobile. If there's one article any hotelier in Scotland should take ten minutes to read this week it is I would strongly suggest you consider this one. As hotels the length and breadth of Scotland face up to the end of season cash drain it is more critical than ever that a thought out distribution strategy is put in place ahead of the 2012. This article touches on the importance of direct distribution, flash sales, rate parity and added value. Maybe hoteliers should read this before giving that two night deal for a tenner to every distribution channel in the world! "One of the best things hotels can do to better manage their distribution costs is just to fully understand what all of the costs are in the first place and what levers they can pull to drive the right mix into their hotel at any given time" says Michael Menis, Vice President - Web and Interactive Marketing, InterContinental Hotels Group (IHG). InterContinental Hotels Group (IHG) recently introduced what the hotel company described as the “most powerful website guarantee ever by a global travel company”. IHG is now offering guests a free night if they find a qualifying lower price on any other website. This promise is part of the company’s new initiatives - the launch of `Best Price Guarantee’ and the `Book With Us Advantage’. Any guest who finds a qualifying, lower room price for an IHG hotel elsewhere online will receive their first night free, and the rest of their stay will match the price found. The benefits of the `Best Price Guarantee’ are available at all eight of IHG’s hotel brands. The industry has undergone some major and permanent changes in distribution with a lot more transparency across all channels. For its part, IHG has come up with "Most Powerful Website Guarantee Ever”. How do you assess the significance of such move from IHG’s perspective as of today? We feel as though this is a very significant move on our behalf to educate customers about the value and benefits of booking direct on our websites. Though there is more transparency across all channels, many customers still believe they will get a lower price or a better deal on a third party website, and this new guarantee is our effort to re-educate consumers that they will get the best price, and many other benefits like earning Priority Club Rewards points, when they book direct with us online. We want to show our customers how much we're willing to back up our promise to have the best price guaranteed on our website, which is why we're offering a free night if they find a lower rate through another site online. How do you assess the approach of hotels’ towards their direct channel management strategy as of today and what do you recommend to them? How can they manage their distribution costs better? Many of our hotels already do a great job in managing their mix, but other hotels have an opportunity to improve how they are managing that mix. We provide a number of education tools and resources to our hotels to ensure they have the right knowledge to best manage their distribution costs as it is most appropriate for their business and market. There is no one size fits all solution. One of the best things hotels can do to better manage their distribution costs is just to fully understand what all of the costs are in the first place and what levers they can pull to drive the right mix into their hotel at any given time. What do you recommend when it comes to hoteliers considering their costs and where possible, reallocate those funds to channels that drive more revenue to their hotels? How do you assess the approach for evaluating costs as of today? Again, there is no one size fits all solution. We provide a number of tools and resources to our hotels to fully understand their costs, their mix, and more. Our goal is to better educate our hoteliers so they have the tools to manage and optimize their business. The distribution side of the hotel industry is expanding exponentially as new channels have emerged. An effort is being made to address a real imbalance in the hotel purchase process by empowering travellers with better information about the specific rooms in a hotel during the research and shopping phase. What do you make of the efforts pertaining to increasing transparency and personalisation? We of course want to be as transparent and personal as possible in dealing with our customers, so we see value in many of the new tools emerging. We are closely watching many of the efforts happening in this area, and are exploring and discussing ways it will impact our business and channels in the future. It is still very early on in the scale and adoption of many of these efforts. Hoteliers acknowledge that there needs to be price parity and rate integrity on retail pricing in both direct and indirect channels. But does price parity really exists in today’s world? There are many instances where OTAs include extras, gift cards or gas cards, on the retail price offered to customers. So while you may see same retail prices on the supplier direct websites and OTA websites, there is clearly a difference in value parity as OTA websites use these extras to convert customers to bookers. How do you assess hoteliers’ concerns? We think parity does still exist. Part of the importance of the Book With Us Advantage, that we launched along with our new Best Price Guarantee, is to educate customers about the full value of booking direct with us. An example of this is that you can earn Priority Club Rewards points when booking online with us and this is not possible if you book a Holiday Inn via an OTA. We know that many consumers would prefer to deal directly with the business or brand they are dealing with, and sometimes prefer this more than an "extra". Nonetheless, we offer many of the same types of promotions through our brands and direct channels that OTAs offer their customers. It seems there is an appetite from consumers to always lap up special deals, discounts and special offers. But do you think hotels are in danger of falling into a trap of working with everybody and having discounts all over the place? In some cases, this is becoming more prevalent and hotels should be smart about what discounts are worth it to provide and when. We know that price is the number one most important thing to a customer when booking a hotel online, but consumers care just as much about the end product they are buying. A discount may get a customer in the door once, but it won't get them to come back if they have a poor experience with a brand or hotel. IHG has just expanded its relationship with TravelShark. How do you assess options which offer hotels an additional vehicle to be discovered by brand-agnostic, destination-based travel searchers? This is not something we can speak to at this time. How do you see the face of online hotel distribution changing in the next 12 months? As a company we are investing in improving our websites and web value proposition to ensure hotels and customers understand and believe in the value of booking direct with us online. This is what our new Best Price Guarantee and Book With Us Advantage are all about. In the next 12 months customers will continue to have a lot of choices in where they book their travel and we want to make sure they are fully educated and understand their options and what they get from all of them. Add value to your own direct bookings - small thing like complimentary tea/coffee at check in, loyalty points, or a gift voucher. Make the difference in value not always price. If you need help with your online marekting stretegy or need to increase your direct online bookings give us a call on 01292 521404 or email us and we'll see how we can help you in 2012.